Then the long chase up the M6 to Greenholme, got there about 20 mins ahead of the train. 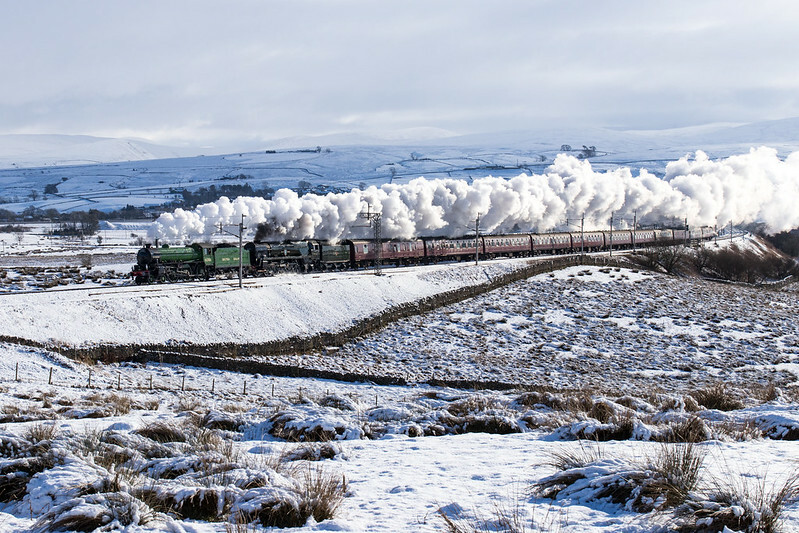 For the return leg somewhere between Kirkby Stephen and Birkett was the obvious place to go, here is a couple of wider angles of the pair at Greengate. One of those occasions when everything came together to make something truly special, I'm glad I was able to witness it. leander, Oakfield53, Dan Hamblin and 19 others like this. 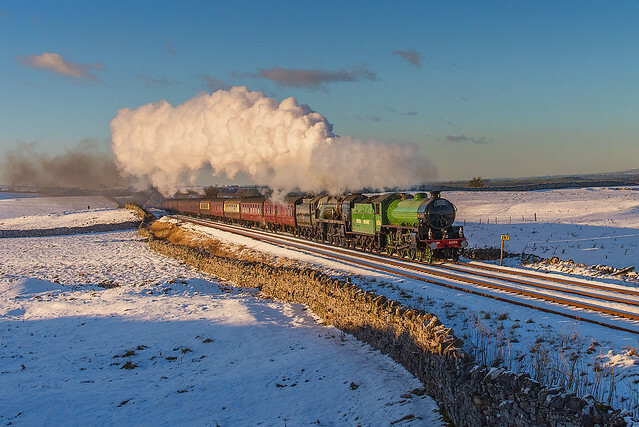 The last one is a lovely shot and by coincidence the rods are down on both locos. With them having the same wheel diameter, it's possible that they stayed in sync for a while. Yes Al. As I said NR should do there own work and not expose others to danger. Co-operation yes but not in this situation. Much debate always about the Carnforth D&UGL to Carlisle mileage for the even time thing. mp6 is at the midpoint of the loop, generally mid-train on the right between the loop and mainline going north. Can't ever remember seeing mp69 on Carlisle approach, Have a vague recollection of seeing a post nearer the north end of the station in the late 1980s when I was taking pictures off the road, but I wasn't timing much in those days so took little notice. Anyone remember seeing the elusive mp69???? Won't argue about the ET run. It was so close that in my book it counts. That said. MP 6 at Carnforth was in my line of sight and I don't recall MP 69.25 being on the platform at Carlisle so I take GPS distances as advisory just as my false low min on Shap! Victor and his cake, with photo courtesy of Shep. Well, that's it then, I've been outed, my cloak of anonymity is in tatters, I've been rumbled. 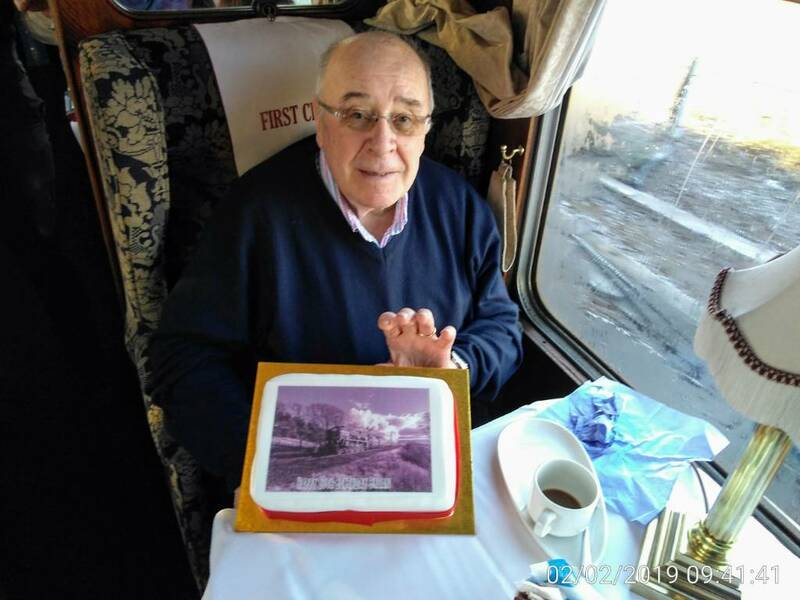 Many thanks to the gentleman administrator for the cake and announcing to all that could hear..........."80th birthday boy "
Mr Waterbuck (Alan) dropped by to say hello. Steam was dropping time coming back over the S&C, we were told it was caused by...........wait for it.........icicle inspections It seems as though with Northern being on strike (again) there we no trains on the S&C so the steam crews were asked to look at all tunnels for icicle formations and then stop at the next box and report. Then a watering problem at Hellifield meant an extra stop at Cherry Tree station for water so we were late into Preston but then.........that 'Les Ross' is something else, what a machine, the acceleration has to be experienced and it meant RT back into Euston. It was my first experience of an 86 and I was impressed, god knows what they're like double headed. The cake ?? well. by diet had come to a bit of a halt recently and I just needed to gain another few ounces to achieve my target weight.........the cake will be a big help (she says I'm a fat git which I think is very harsh. Dan Hamblin, Fred Kerr, alastair and 15 others like this. Yes it was a great day and one of those West Coast/RTC gems that only they seem able to pull off. The only 'down side' was not wishing @Victor a Happy B'day in person but the sentiment is heartfelt, nonetheless. And, hopefully, this is also a postscript on all this mileage business. My point of reference on such things is actually not my trusty GPS with all its apparent pinpoint accuracy but the historical data available and for this my reference point is British Pacific Locomotives (C.J. Allen). This gives the mileage to Carlisle from Carnforth as 62.85. Add on the distance from MP6 to Carnforth (0.25) and you get 63.1 miles (or 63.11 from the RPS database). Yes we can debate where your coach started from in the Loop and where you ended up under the roof (GPS accuracy?) at Carlisle but to my mind the distance is 63.10/63.11 miles. No argument. And 63.25 minutes is close enough to even time for me - an unlikely loco combination to give us a record, methinks. And more significant is the fact that we also ran from Grayrigg to Shap in even time. Double headed or not, that will take some beating. Be pleased if you were on it. Be grateful if you were not that such things are possible in 2019.
acorb, Waterbuck, MellishR and 5 others like this. 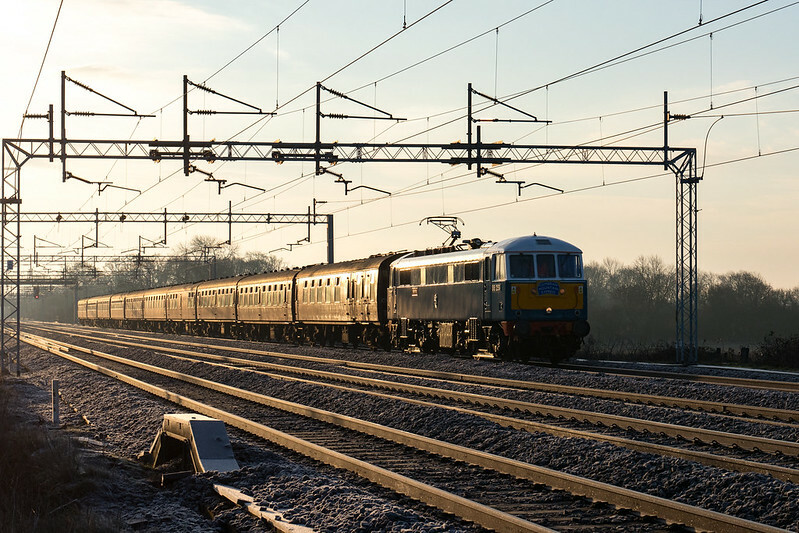 We don't do many day railtrips but last Saturday really was something special. Tiring for t'owd folk but well worth it. And a mention for the stewards (coach D), they were top class. 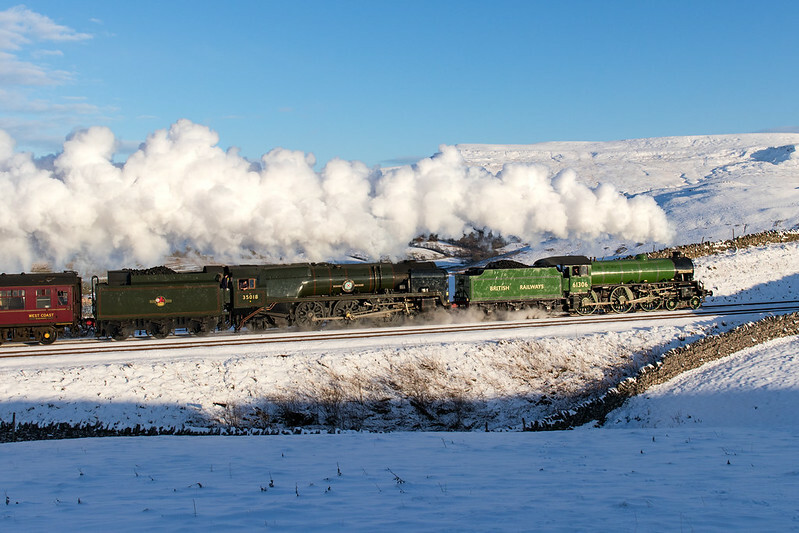 leander, Dan Hamblin, FlyingScotsman4472 and 14 others like this. I got the 63.11 from the Track Diagram that gives Carlisle as MP 69m 9 ch. Like you I consistently get figures in your range, enough to convince me that it’s probably correct especially if you display the gps track on a map and it shows the track ending at the point on Carlisle station where you know you stopped. I only quoted both figures to illustrate the subtle difference and to prevent anyone saying, “it’s really only 59.whatever” - as if they would! I got the 63.11 from the Track Diagram that gives Carlisle as MP 69m 9 ch. So there you have it - 63.11 miles. Other authoritative sources are available such as Network Rail's own track diagrams that also give Carlisle as at 69 miles 9 chains. Maybe I am wrong to assume that NR knows the mileage of their own network. Isn't it usually the case that if there is a possibility that there may be problems on the line (e.g. fallen tress after heavy winds, another train reporting that it may have hit somethong, or, in this case icicles in tunnels), the next train will be asked to proceed at caution and inspect the line, which is what happened in this case. If you look on realtimetrains at the first two service trains over the S&C on Sunday, you will see that they both lost a lot of time over the S&C. I'm guessing that they were also cautioned for the same reason after a very cold night. This tour I had the priviledge of being on, id not originaly planned to go on Feb 2nd's tour as I was supposed to go on the run for Jan 26th but thanks to Northern striking I had to axe that plan and transfer to the run in Feb. I was pleased to hear that it had been decided that 35018 was to work the train but was absolutely shocked at the thought that she could be double heading with Mayflower. Can certainly say I was excited about the thought of what could be and the rumour did indeed become true when both worked the tour. Infact only a few days before id said I would like to travel behind Mayflower on a tour one day even if it meant having to go down south, seems though that someone read my mind. Certainly was a great 25th birthday present for me (even though my 25th was on the 13th Jan). leander, iancawthorne and Waterbuck like this. A friend has contacted me to say that he left a tripod (a Velbon Sherpa with pan and tilt head) in the small parking area near the hotel at Shap Wells on Saturday. Upon realising this, he returned in the hope of retrieving it, to no avail. If anyone picked it up, or spotted it, please could you send me a PM. 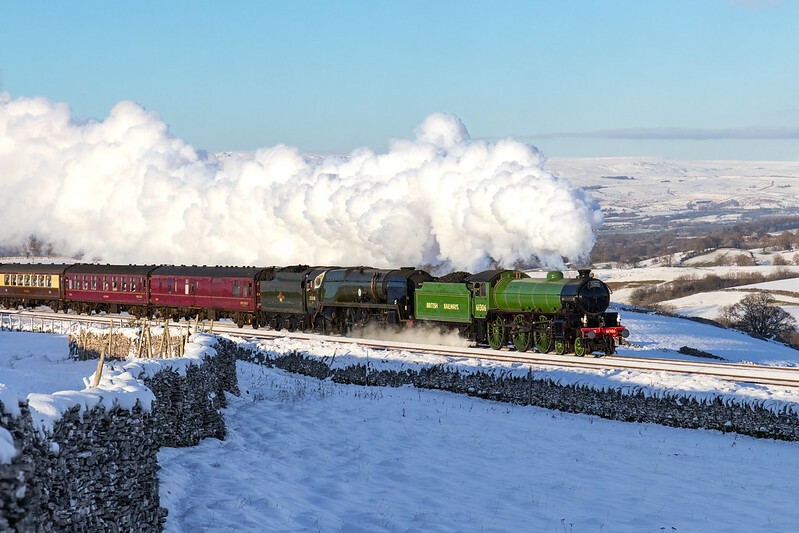 This picture was in the Telegraph earlier this week... (taken shortly after one here: https://www.telegraph.co.uk/news/2019/02/04/pictures-day-4-february-2019/). nige757, Haighie, Dexter and 1 other person like this. Ian, I’ve just watched Moylsey’s video #294 that shows the train stopping short of KS with the signal at danger then later when the train restarts the signal has cleared about 12-12.5 mins in. Thanks David, that confirms it was not frozen signalling. Anyway does anybody know which loco is going to work the train on 23rd?